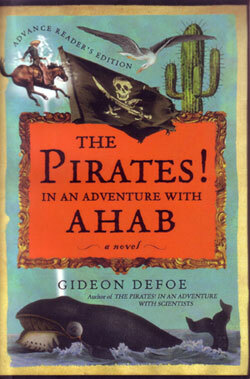 Back in the charming days of yesteryear (I think it was 2004), Gideon Defoe took the literary world by storm with his groundbreaking novelette, “The Pirates! In an Adventure with Scientists.” Never before had the gritty world of pirates been so vividly realized, complete with the utmost attention to both historical accuracy and poetic beauty. I am, of course, full of it. Like its predecessor, Defoe’s second work, “The Pirates! In an Adventure with Ahab” is sure to throw humorless historians into a tissy. But for the rest of us, it’s another wonderfully demented bit of comedic genius. Once again we’re invited to follow the adventures of a hapless crew of no-name pirates (“The Pirate Captain”, “The Pirate with a Scarf”, “The Pirate Who was Good at Math” and such), this time as they seek a way – any way – to gather the needed money to pay off a debt to the most dangerous of villians, Cutlass Liz. They attempt to gain said loot through a range of efforts, from improv-theater to whaling to out-right pirating. Seldom would I refer to an artistic endeavour as “wacky” and mean it as a compliment, but this would be the exception. “The Pirates! In an Adventure with Ahab” is wacky, off-kilter, irreverant, and highly entertaining. Gideon Defoe keeps his books at bite-sized length (approximately 150 pages) making for a light and easy read. I enjoyed this book, much as I enjoyed his previous, and look forward to many more. This entry was posted in Books and tagged defoe, fiction, humor by Bilgemunky. Bookmark the permalink.